The first snippets of information about the Masterplan has started to be released in the article below. The draft Masterplan will be fully released later today for consultation until the 14th September. Creating an "integrated transport facility"
The First Minister Carwyn Jones said the improvements were "ambitious yet achievable". Deb Barber, CEO of Cardiff Airport, added: "This masterplan has been created to set out milestones up to the year 2040 that enable us to meet our vision for the future and position Cardiff Airport as a key part of the UK's transport strategy." Cardiff Airport is asking for feedback on the draft plan by September 14. A final plan will then be launched in the autumn. More detailed article from Wales Online. Cardiff Airport has unveiled its vision for the next 20 years. The plans are to develop the airport over the next two decades, with the aim of growing the current 1.5m passengers a year. The new terminal will be based on two-levels and has a total GIFA (Gross Internal Floor Area) of approximately 40,000 sq m.
It is planned that the new terminal will be connected to the hotel and car park. A phased delivery of the plans will ensure the airport remains operational while the new terminal is built. Once completed, the existing terminal will be demolished and the area used for aircraft stands. A partner for the proposed hotel will be explored over the coming months. 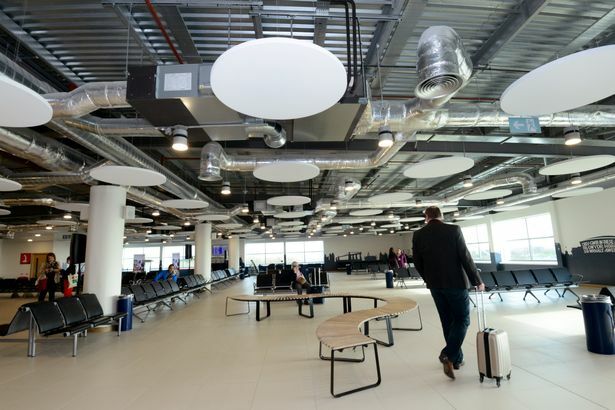 The current departure lounge recently underwent a £4m revamp, which included additional seating, two new Costa Coffee branches and an extended WH Smith store. Part of the upgrade also included a brand-new business lounge, the 51° Lounge, and a revamped executive lounge which has its own bar. 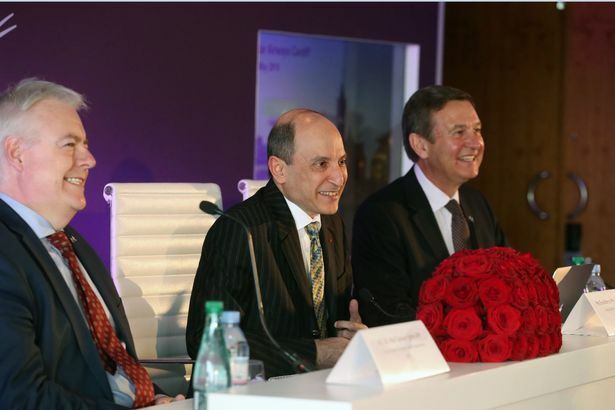 The renovations coincided with the start of the new route to Doha’s Hamad International Airport with Qatar Airways. Qatar provides capacity for 150,000 passengers a year, as well as significant freight capacity for Welsh exporters, at around 10 tonnes a flight. The airline is targeting a catchment of 6.4 million people in south Wales and the south-west of England. 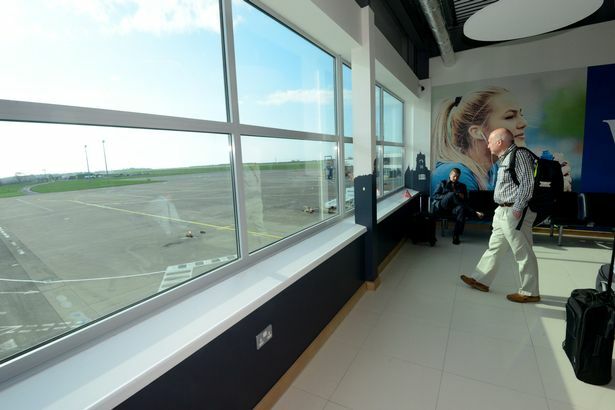 In February the head of one of the world’s biggest airline groups raised the prospect of low-cost transatlantic flights out of the Rhoose-based airport. However, chief executive of IAG Willie Walsh said the business case for its new airline LEVEL launching any new routes from Cardiff Airport would be enhanced if air passenger duty on longhaul flights was abolished. IAG also operates British Airways and Vueling, which currently operates flights out of Cardiff Airport. 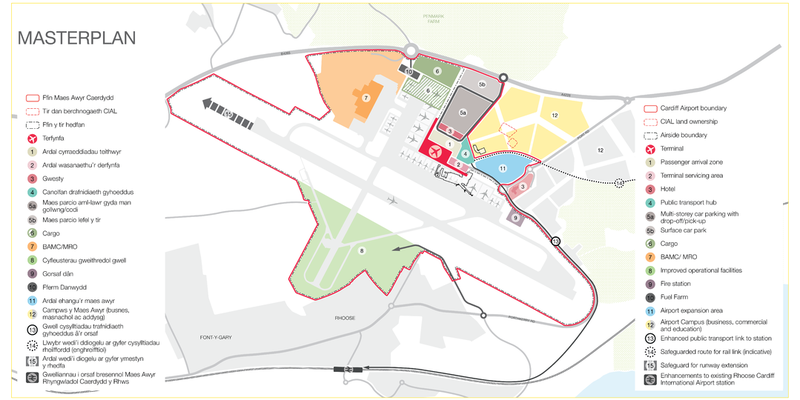 The airport has also agreed a 10-year contractual joint venture with the Welsh Government to take over the operation, management and maintenance of the St Athan airfield and business park when existing arrangements with the Ministry of Defence (MoD) and Serco come to an end on the March 31, 2019. While Cardiff Airport is owned by the Welsh Government, it is run by an arm’s-length commercial company, Cardiff International Airport Ltd.
Economy and Transport Secretary Ken Skates said that under the plans the business park, combined with the airfield activity, would generate significant economic benefits to Wales amounting to around £236m and approximately 2,000 jobs, which includes the 750 already committed by Aston Martin. Mr Skates said: “We know we do not have the internal expertise to operate and manage an airport directly. Under the current arrangements, we have an obligation to the MoD to operate, manage and maintain the airfield for military purposes. “Our plan now is to transfer responsibility for airfield operations, including management and maintenance, security, radar services and air traffic control, to a single-source supplier. 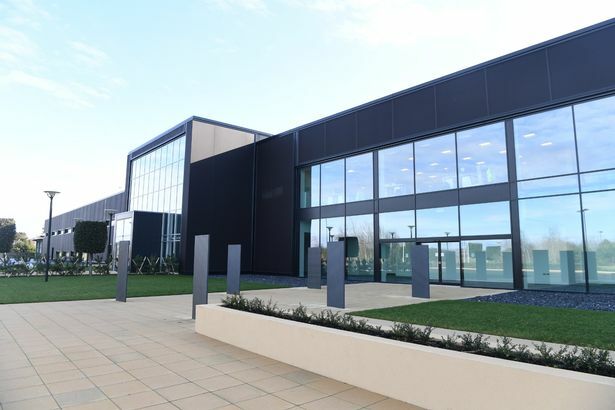 “Cardiff International Airport Ltd has been identified as the only supplier capable of providing all services required, due in part to its proximity to St Athan. 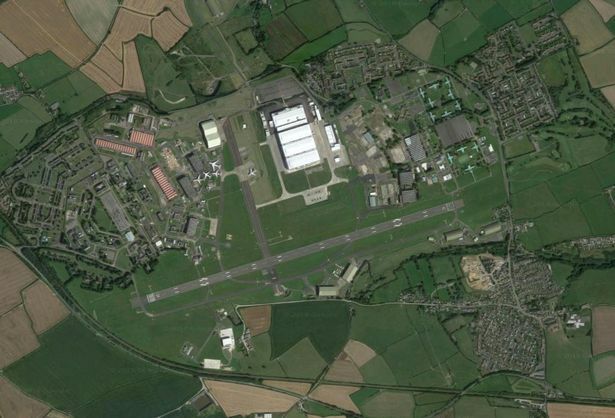 “We have developed a proposal to manage the transition of the airfield from Military Aviation Authority (MAA) to Civil Aviation Authority (CAA) licensing and have begun making submissions to CAA in this respect. Cardiff Airport CEO Deb Barber added: “The Minister’s announcement complements the release of our draft Masterplan which sets out our vision up to 2040. Since Cardiff Airport came under public ownership in 2013, we have worked tirelessly to improve the terminal infrastructure, increase passenger numbers and welcome new routes and airlines to Wales. “As we enter the next phase of our journey, we remain focused on delivering a sustainable airport business focused on continued passenger growth, improving infrastructure and maximising opportunities to diversify the business. The “Draft Masterplan” was launched by First Minister Carwyn Jones, Mr Skates, airport chairman Roger Lewis and Ms Barber. Mr Jones said: “These improvements are ambitious yet achievable and will enable the airport to continue its development of further aviation links to the rest of the UK, Europe and beyond, which will improve its competitiveness and attractiveness as a gateway to international travel and trade. The passenger numbers predictions seem to be very realistic almost cautious. Rodger Lewis has responded in the Q&A session at the launch that these were realistic figures. They did not include any exceptional events. Does anyone know the current square footage of the current terminal? The master plan is predicated in the main on projected passenger numbers over the next 20 years. That can never be an exact science of course - too many unknown variables can intrude for starters - but I cannot help but believe that the airport is being extremely cautious with the number of passengers it believes it will handle over the next two decades. The previous master plan, prepared over ten years ago at a time when the airport was enjoying its best ever period for passenger volume and airlines, turned out to be excessively over optimistic. There were reasons in part for that, the recession and the attitude taken by the previous owners towards their airport probably being the main ones. Basing the new master plan on 2 mppa by 2021, 2.5 mppa by 2027, 3 mppa by 2036 and 3.2 mppa by 2040 seems low key in the extreme. I'd have thought they would be looking to grow the airport at a significantly greater rate than that. A four-aircraft base from, say, Ryanair or Jet2 would add 1 mppa within the first year on its own. That could come within the next two years meaning 2.5 mppa would be reached by 2021, not 2027. I can't think they have deliberately underplayed their projections so that any outperformance could be seen as the airport exceeding expectations, as that's not the way for a company to plan for the future. Is anyone else surprised at the low passenger projections or am I being hypercritical? A government owned asset (at the moment) would be very, very silly to declare optimistic figures. Chances are that the 2021 target will be smashed a year or two before that. It’s all party political unfortunately. Rodger Lewis said that the Master Plan was based on organic growth and therefore not based on any exceptional events. An exceptional event was hinted as any sudden announcement for say a Trans Atlantic route. I also imagine they want to be very cautious in what they are predicting especially considering what happened with the previous Master Plan. Not only that being a Government owned asset they will be held accountable by not only the media but other political parties. It as also made clear that developments in the future or Master Plan will be funded by the airport through revenues and also private investment. The one thing that isn't clear however is at what point in the process will each development potentially take place unlike the previous version. This will make it impossible to track how closely the Master Plan will be followed. - The new terminal appears to be double in size of the current terminal. - Eastern and Western piers seem to be at least double in size. - The main terminal building appears to be two-three stories throughout also with likely the top floor being administrative block. - Increase of 7 aircraft Stands (26 Stands up from current 19 Stands). - As the plan looks as if all 26 stands can be used simultaneously it actually increases by 10 from the current 16 maximum aircraft at any one time. - It also appears that 7 of the 26 stands can accommodate wide bodied aircraft. - Cargo facility will be moved to the bottom of Echo. - Cargo aircraft parked immediately in front of the cargo facility. - Fire Station located from Southside of the airfield to Northside near the current location of the fuel farm. - Taxiway Echo will become an active and busy taxiway which means no parking for special events. - Multi Storey Car Park meaning most parking will be on site. I think Tinkerman is right because of the political aspect they have to underplay the numbers and if they achieve those numbers earlier that looks better for the airport and government. It's still a business whether government-owned or not; in fact, it's supposed to be an arm's length, stand alone company. The airport company directors and officers should be above party politics, or politics in general. Their legal duty is to do their best for the shareholders (the tax payer in the long run). If they are deliberately underplaying likely passenger numbers, and therefore the future shape of the master plan, solely for party political reasons it's a slippery slope. For the avoidance of doubt I'm not saying that they are because I don't know. Given that the new terminal and related infrastructure are apparently based on the projected passenger figures published today, was any indication given at the presentation as to what the overalll capacity would be? For example, if by 2040 the airport was handling 6-8 mppa could the envisaged terminal cope with that or would extensions be needed? 7 widebody stands and and 11 airbridges that's quite a lot! Considering the current terminal is supposed to able to handle 3 million passengers a year if the new terminal is twice as large then 6 million could be possible? The current terminal as it stands certainly has a maximum capacity of 3 million passengers. I envisage that providing they utilise the new terminal properly and based on current size v possible size the maximum capacity could be up to 10 million per annum or more. There has been no official mention on the maximum capacity of the new terminal. Cardiff Airports video of the Masterplan event. I was intrigued to see that amongst those supporting the initiative was a representative from Visit Bath. Currently the Visit Bath website does not include CWL amongst the gateway airports to the city; it only mentions BRS, LHR and LGW. I don't know whether the Qatar route is what is attracting the interest of Visit Bath. It may be possible they were invited to the event by the aiport to build a relationship up with them? Very likely I would have thought and Qatar must surely be the attraction. Only just caught up with this - v. good news for Cardiff. A number of you have pointed out the passenger figures seem to be rather cautious and on the lower end of what the airport could achieve. The target of 2mppa by 2021 is consistent with an 8% increase each year - which is roughly what Cardiff achieved last year. However after 2021 the predicted growth drops to 4% then further to just 2%. Interestingly if Cardiff maintained an 8% growth it would hit 3.2mppa by 2027. A four-aircraft base from, say, Ryanair or Jet2 would add 1 mppa within the first year on its own. I suspect if a TATL flight is considered an exceptional event then a four aircraft base from any airline would also be considered an exceptional event. In the three calendar years 2015, 2016 and 2017 annual passenger throughput grew by a total of 445,000 passengers from 1.019 million to 1.464 million with 2018 continuing that trend - the 12 months to May this year saw 1.511 million passengers, up 9.2% on the 12 months to May 2017. Annual percentage gains (and I'm always cautious with such measures as base figures have to be taken into account) in the years 2015-2017 were respectively 13.6% (an additional 139,000 passengers); 16% (186,000); 8.9% (120,000). The initial growth was mainly due to the new Flybe base which has grown since its inception in 2015 and may well do so again next year. The likes of TUI and Thomas Cook will also chip in with more seats in 2019 - in TUI's case an additional based aircraft for summer. Then there is Qatar of course. All this on its own points to the growth of the past three and a half years continuing through 2019 and modest additions from existing carriers beyond that could easily reach the 2 mppa figure by 2021 or earlier. That was not my point in earlier posts. I am very surprised at the passenger projections through the later 2020s and 2030s. I know some believe this might be a form of deliberate under-playing perhaps for party political reasons which if true I find astonishing and difficult to countenance. The airport says that future airport development will be based on airport revenues and private investment. Growing from 1.5 mppa to just over 3 mppa in 20 years isn't likely to generate huge profits even if the cargo and the St Athan venture flourish. The current WG administration has hinted very strongly that it intends to keep a majority share in the airport's ownership. So a private sector partner would be faced with a minority holding and a modest passenger growth scenario. CWL is ambitious and its custodians have the admirable desire to develop the airport into a facility worthy of the country and its capital city. That being so I'd have thought that a substantial presence from another airline or airlines would be essential and not an exceptional event.